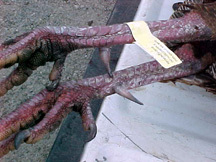 MAHA holds Eastern turkey hunting leases in Kansas, Missouri, Iowa. No surprises in our article. Just greater insight into private land self guided hunts we provide. Do it yourself hunts where each member may hunt all three states using 5 spring season tags, a flat rate. More fall tags available. With MAHA leases covering tens of thousands of private land acres there is much opportunity. Spring season or fall offers long seasons, many birds which typically occupy small, same home range from season to season. Driven by small acreage farms divided on a 1 mile grid road system creating repetition of crop adjoinging cover in a small easily traveled through in a day terrain. 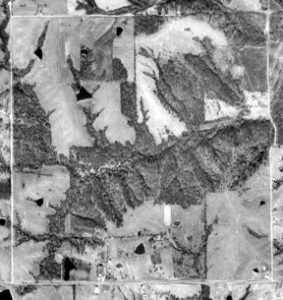 Central mid-west habitat consist of wood patches from 5 to 50 acres connected by wooded/brush/grassed creek bottoms on slowly rolling hills. Ridge runners will find these small hills combined large flock size like heaven. Same is true of those from southwest/western states who may be pleased to harvest one spring tom back home surprised to find a larger number of tags available at OTC purchase. Northern hunters are similarly fascinated our season is open to anyone that can buy a tag. Eastern Turkey flock size generally is above 30 birds. Many flocks numbering more than 50. A concern expressed by some applicants is better spots will have been reserved by older members. Or, locked up over an entire season. This does not occur. All members are limited to a maximum of four reservations at a time. Before another day can be booked, one of the original 4 days must be consumed. This creates open days across many leases. However, Association does limit its membership by both an overall cap then subordinate caps based on primary then secondary hunting interests of applicants compared to current membership profile. Idea is not to have too many of any one type of hunter. Bottom line is, as long as we sustain these two key facets about this Association, i.e., no one is ever denied a hunt, everyone may hunt on their schedule without competition from others, this Association will sustain its membership. When we allocate a membership it is due to an applicant’s qualities plus there is room for another. We expect all hunters to return each year as a tradition knowing they will only return if they get a hunt they expect. We work towards good hunts always. A time proven reservation system separating hunters across individually numbered on maps leases adds a great deal of assurance hunters will be safe. This same reservation system also ensures we never over pressure any one lease. Common Eastern Turkey terrain shown below. A 1 mile square section framed by country dirt roads. 640 acres. Key points are ponds, a year round dependable water source. North half is where a flock roosts, feeds, loafs, probably due to an active farm yard in south center. This farm is heavily compartmentalized by slow rolling terrain isolating several fields from road observation. A final observation is it is all hay or pasture. Not a single crop field. 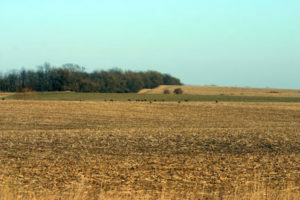 Its lack of crops seemingly has no effect on flock presence. Longest beard has been 18 inches. Most number of beards on a single tom, 8. Heaviest on a scale topped 29 pounds. 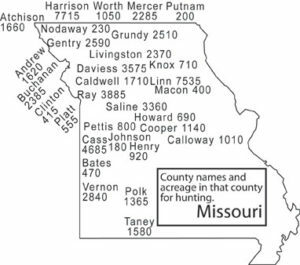 Amongst these three states Missouri has more turkeys overall. Iowa least. Kansas in-between. With each state comes different habitat. Iowa has plenty of birds. They do greatly limits their turkey tag access. A competitive draw for nonresident spring tags. 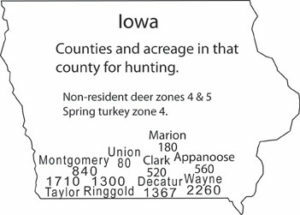 Draw tags plus their higher cost drives many not bypass Iowa. Iowa habitat is slightly rolling, wood patches connected by drainage wooded or otherwise in cover. Predominate grain farming region. Mostly corn or soybean on almost every field. Those who have hunted Iowa to date have around a 99% success rate. Occasional misses have been youth or weather related. High success is also a skewed statistic. Association hunters willing to pay for their field time on top of Iowa’s high tag costs drives those who do hunt to be serious with their endeavor. 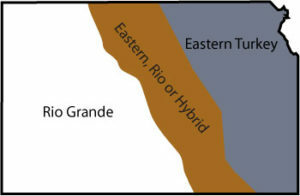 Kansas Rio Grande, Eastern Turkey Range, map right. Iowa and Missouri are all Eastern Turkey only. Kansas with its liberal 8 week season and Rio Grande Turkey receives much less spring season pressure than Missouri. The pressure it does get is more widely spread across the season. Kansas also has a reputation for less intelligent compared to Missouri turkeys. What may really be a significant distinction to Kansas is large fields before being dissected by wood patch’s, brush with far more native grass. Spring season allows two toms. Season overlaps that of Kansas. 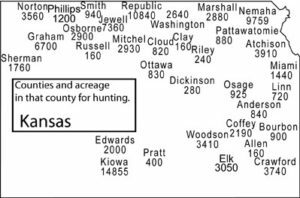 Association’s majority non-resident hunters seek this overlap to maximize tags during a single trip. Due to its national ranking does receive more pressure. Closed in cover. As closed in as it gets in this region. Corn or soybeans on every farm. Cattle on small acreage operator non-plowed ground. What we bring to turkey hunting is private land access we all desire for a more leisurely approach to self guided turkey hunts than can be achieved through public land or knock on door access. Ignore the birds. Look at our open terrain. Interdicting movement patterns more effective than Run & Gun. Better turkey hunting is within agricultural regions where 45 – 55% of land use is farming. Mid-America Hunting Association, land we seek to lease for better hunting is where land use is for grain farming. Not cattle. Contrast this with heavily forested regions as Missouri’s Ozark Mountains where 70% of land use is timber, the remainder of rocky soil for cattle driving turkey flocks to drop off dramatically. We stay out of such non-wildlife supporting region.